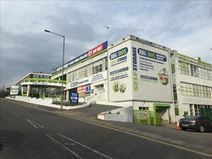 A range of office units are to let in this popular office building close to Brighton seafront and town centre. The offices are offered on flexible terms, and are ideal for both new and established businesses. On-site car parking is available as well as good access to public transport. With double height spaces and spacious mezzanine balcony areas, these offices are part of a self storage facility that provides additional space options to help companies grow. The property is easily accessible from both Brighton and London, and there are a range of useful amenities in the immediate area including a supermarket, a petrol station, a pharmacy and places to eat and drink, such as cafes and pubs. Fully furnished office spaces in varying sizes are offered for rent on flexible terms. The offices are located a short distance from the A27 with plenty of on-site parking and access to meeting rooms. Based in the centre of Brighton, this centre prides itself on being an ideal first home for start-ups and young businesses wanting to progress from shared space. With all inclusive heating and electricity, cleaning and rubbish removal included, and the offices coming fully furnished, it is a great prospect for those looking for an easy transition into their new home. The centre is within 15-minutes walk of all of Brighton's amenities and attractions, including the station, The Lanes and the famous Brighton Palace Pier. Located in Brighton, this centre has excellent amenities including meeting rooms, shower facilities, bike racks and a fully staffed reception, as well as a fantastic on-site cafe. Brighton Railway Station is easily accessible and provides services to London and beyond. There are also bus services across the town, so the space is very well connected. Explore Brighton's many attractions in your free time, including the famous Pier and impressive Royal Pavilion. A range of fully modernised offices are available in the heart of Brighton. The offices are all furnished to a high standard and have access to meeting and conference rooms. Shops and cafés are close by and Brighton Railway station is just a short walk away, so services to London can be easily accessed. With 24-hour access available, the space is excellent for flexibility, especially if your business does not work the nine to five. Desk space, office space, meeting space, event space and social space all under one roof in central Brighton"s iconic North Laines this collaborative environment is a five-minute walk from the station and a 10-minute walk from the seafront. The station provides a range of services, including regular trains into London Victoria. From its sixth floor setting there are inspiring views in all directions. This listing offers modern and spacious office space for a business of up to sixteen people. The office building is located in the centre of Brighton, with many great transport links and shops located on the doorstep. The building has great amenities, this includes the likes of 24 hour access, kitchen facilities and WiFi. Brighton beach is located just an eight minute walk from the work space, offering the perfect place for a lunch time break. In the heart of Brighton and with an impressive range of amenities, this is the perfect space to spend your working day. Reception services, a kitchen area with fresh coffee daily, meeting room availability and varying office sizes are all on offer at this location. Brighton Train Station is just 10-minutes' walk away, providing frequent, direct services to London Victoria, and London Gatwick Airport (LGW) is easily accessible. Offices are for rent in a modern building set within the beautiful surroundings of Brighton, and are ideally located for both public transport options, including Brighton Railway Station, and shops. Tenants can access the space 24-hours a day, and there are meeting rooms available, as well as office cleaning and great breakout areas. Brighton has many amenities and fantastic attractions for you to enjoy. Nestled in the heart of The Lanes - Brighton's historic and famous neighbourhood - this centre offers you the chance to become a part of a vibrant community of young entrepreneurs. With co-working, hot-desking and private offices available, the centre is an exciting proposition for all and can accomodate teams of up to 12. The space sits just 50 metres from the beach and is surrounded by quirky stores and eateries. Brighton station is just a 13-minute walk. This space offers a fantastic working environment, and has excellent facilities including office cleaning, printing and copying facilities, meeting room availability and access to kitchen facilities. There are excellent transport links with the centre being located opposite Brighton Railway Station, and there are various attractions around the town for you to enjoy, including some wonderful places to eat and drink. 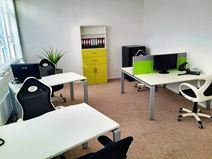 Within a short walk of both Brighton Railway Station and the beach, this modern business centre provides a calm and inspirational place from which to work from whether you want to co-work or work from your own office, surrounded by like-minded people from a diverse range of organisations. Brighton offers wonderful places to eat and drink, as well as attractions and landmarks such as the Royal Pavilion.